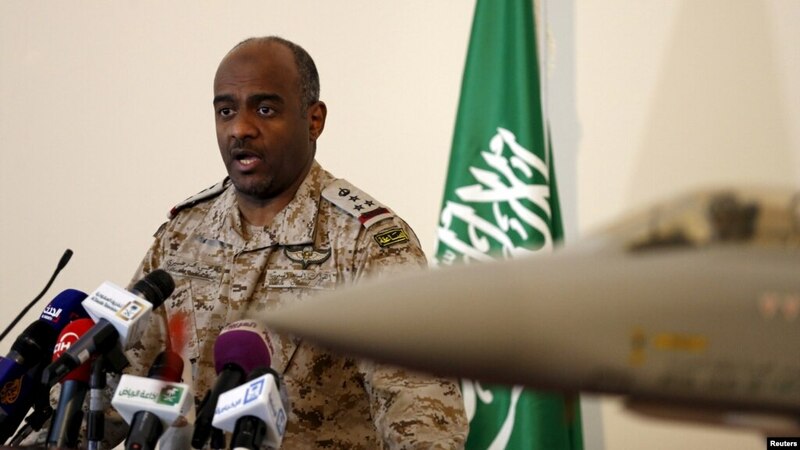 FILE - The official spokesman for the Saudi Ministry of Defense, General Ahmed Hassan al-Assiri, speaks during a news conference in Riyadh, March 26, 2015. Saudi Arabia appears intent on reaching across the Red Sea to build alliances in the Horn of Africa, where piracy, drug and weapons smuggling, and terrorism threaten commerce in the world's busiest shipping lanes. This was evident during the Saudis' intervention in Yemen. Over the past year, they built a coalition of African partners to help dislodge Houthi rebels who were in control of most of the country, including the capital, Sana'a. Eritrea played a key role, although it was not technically part of the Saudis' 12-nation coalition. Eritrea allowed the United Arab Emirates to use an airbase and logistics hub in the port town of Assab. The two countries also shared intelligence. "Peace and stability in the Horn of Africa is very important for us," Brigadier General Ahmed al-Assiri, a military adviser for the Saudi minister of defense, told VOA in a recent interview. "This is why we coordinate with Eritrea, with Djibouti, with Ethiopia, with Somalia, with the legitimate governments of Yemen and Sudan, to make sure that this area is controlled and secured to avoid ... trans-border crimes." Analysts say the Saudis' interest in the Horn of Africa is an extension of their intense competition with Iran for influence in the Middle East. 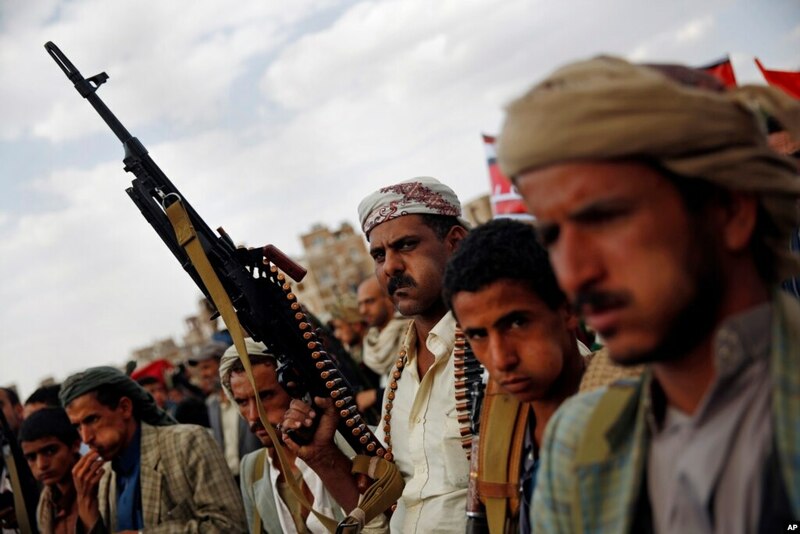 FILE - A Shiite Houthi rebel holds his weapon as he attends a rally to protest Saudi-led airstrikes, in Sanaa, Yemen, Aug. 24, 2015. Phillip Smyth, a research associate at the University of Maryland and an adjunct fellow at the Washington Institute for Near East Policy, says the Saudi diplomatic surge in Africa is specifically aimed at countering Iranian influence. "The Saudis are now aggressively reaching out to any state [in the Horn of Africa and beyond] that may have actually had any contact with the Iranians or have dealt with the Iranians," Smyth said, "in order to bring them under their wing and demonstrate that [Saudi Arabia] can actually function as a regional hegemon [significant regional power]." Smyth noted the Saudi outreach includes Sudan, a historical ally of Iran, which recently received approximately $5 billion in military aid from Saudi Arabia and was part of the Saudi coalition in Yemen. The Saudi arms deal with Sudan really is an accomplishment, Smyth said, "in terms of countering [Iranian influence] in the African Horn region." There also are reports that Saudi Arabia has promised $50 million to Somalia if Somalia severs diplomatic ties with Iran. Observers find these new alignments interesting because, from a broader perspective, they put countries like Eritrea and Sudan on the same side as the United States, which supports both the Saudi-led coalition in Yemen and the coalition against Islamic State (IS). These may be some of the few things Eritrea, Sudan and the U.S. agree on in terms of international policy. 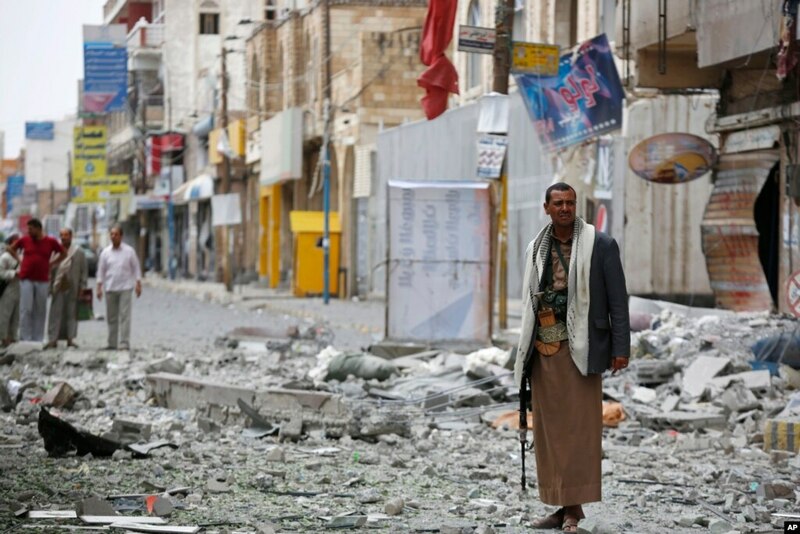 FILE - A Shiite fighter known as a Houthi stands guard in front of buildings destroyed by a Saudi-led airstrike in Sana'a, Sept. 5, 2015. In fighting IS, "the main jihadist enemy," Ambassador Herman Cohen, a former assistant secretary of state for African affairs, says the United States is "relying ... on Arab nations, especially the Sunni Arab nations led by Saudi Arabia, the Emirates, Kuwait and Jordan." "And here we have Eritrea aligning itself with the same coalition," Cohen told VOA. "So, therefore, the United States and Eritrea are on the same side." Cohen, who has long advocated improved U.S.-Eritrean relations, believes Asmara and Washington can develop closer ties if current trends continue. "Eritrea and the United States should be working together and not be angry at each other and not having normal relations," he said. "It doesn't make sense for either side." In an interview on Eritrean national television in January, Eritrean President Isaias Afwerki seemed to hint at a willingness for increased regional engagement. "Without taking limit, scope and size into consideration, collaboration of the regional countries is key," he said, referring to Eritrea's involvement in the Yemen coalition. "We can say that the announcement of this Saudi-led anti-terrorism effort is a small part of a bigger plan." My husband and I have been married for about 7 yrs now. We were happily married with two kids, a boy and a girl. 3 months ago, I started to notice some strange behavior from him and a few weeks later I found out that my husband is seeing someone. He started coming home late from work, he hardly care about me or the kids anymore, Sometimes he goes out and doesn't even come back home for about 2-3 days. I did all I could to rectify this problem but all to no avail. I became very worried and needed help. As I was browsing through the internet one day, I came across a website that suggested that Dr Unity can help solve marital problems, restore broken relationships and so on. So, I felt I should give him a try. I contacted him and he did a spell for me. Three days later, my husband came to me and apologized for the wrongs he did and promise never to do it again. Ever since then, everything has returned back to normal. I and my family are living together happily again.. All thanks to Dr Unity . If you need a spell caster that can cast a spell that truly works, I suggest you contact him. He will not disappoint you. This is his E-mail: Unityspelltemple@gmail.com .